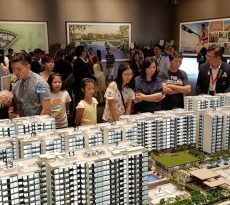 The former Eunosville site which’s sales gallery was previewed on the weekend of Nov 3-4 saw a crowd of more than 5,000 people thronging its sales gallery located at Sims Avenue adjacent to the site. 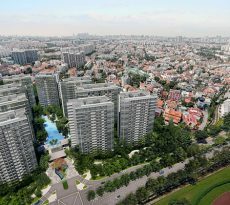 The former Eunosville site which has now been christened Parc Esta is a highly anticipated development and the closest private condominium to Eunos MRT station. The former Eunosville site site is also just one stop away from Paya Lebar MRT station and Paya Lebar Central (PLC). PLC is earmarked by the government as one of several commercial hubs to be developed outside the city centre. 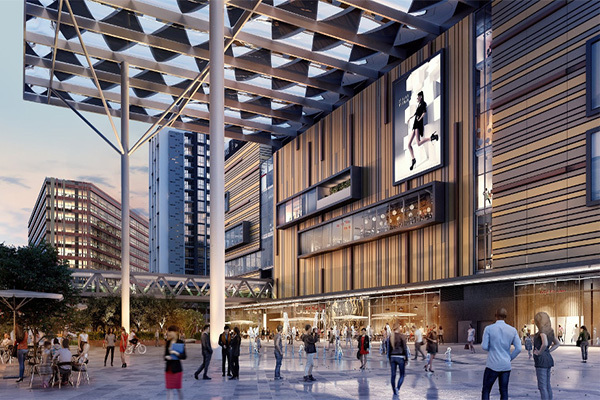 Developments like Paya Lebar Square and the SingPost Centre mall are also within this hub. PLC also houses Lendlease’s Paya Lebar Quarter (PLQ), a $3.2 billion landmark integrated project comprising Grade-A offices, a shopping centre and the luxury Park Place Residences condominium. Parc Esta will contain five shops and 1,399 residential units spread across nine 18-storey blocks, said its developers MCL Land. Buyers will have a choice of one- to five-bedroom units ranging from 420 sq ft to 1,604 sq ft.
Prices for the former Eunosville site will start from about $698,000 for the smallest unit. 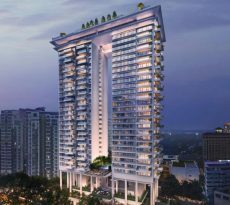 Considering the prices at Park Place Residences (the last residential project to be launched in the area) which starts at $900,000, the prices are at Parc Esta are reasonable. Parc Esta (formerly known as Eunosville) is an exciting new property launch by the award-winning developer, MCL Land. Sitting along Sims Avenue, just opposite the Eunos MRT station, the development features an ultra-modern design and is set to be one of the most coveted properties in Eunos District (D14). Parc Esta’s strategic position between the East Coast Park, CBD and Changi Airport means residents will enjoy even greater convenience in terms of work and play. Parc Esta sits on a massive 376, 713 sqm plot area and is expected to house a couple of short tower blocks carrying a total of 1,400 residential apartments. Each unit will feature high-quality finishing with well thought out window designs to allow for sufficient inflow of natural light and wind. In terms of configuration, the condo development will consist of 1 to 5 bedroom unit mix. That makes it an ideal home for singles, newlyweds and even multi-generational families. Parc Esta is equipped with numerous facilities that can serve residents adequately. Some of these facilities include a 50-meter lap pool, indoor gym, playground, tennis court, sun deck and BBQ pits and 24-hour security. There is also a range of concierge services offered within the condo, which residents will be delighted to have. Parc Esta’s location at the heart of mature District 14 means future residents will be proffered with a range of world class amenities that will make their lives convenient, fun and hassle-free. Besides the MRT station which is at its doorstep, those who drive will be delighted to know that it takes a mere 3 minutes to drive to the East Coast Parkway (ECP) heading to the financial district. The Pan Island Expressway (PIE) is just 3 minutes’ away from the development and provides a convenient access point to the Orchard Road Shopping belt. Changi Airport is approximately 12 minutes’ drive away from Parc Esta, making the process of travelling to destinations outside Singapore both quick and seamless. Residents seeking to enroll their children to school can never have a hard time as there is a plethora of world-class schools situated nearby. Such schools as Tajong Katong Girl’s School, Tanjong Katong Secondary and Haig Girls School, sit just a few yards away from the condo and offer good academic teaching and extracurricular activities. Shopping will be an all fun and convenient affair for residents of Parc Esta thanks to the many malls and supermarkets found in the immediate neighborhood. One KM Mall is the closest, sitting just 5 minutes away from the condo. Other shopping malls include found nearby include SingPost Mall, Payar Lebar Square, Joo Chiat Complex and Singapore Post Center. The Parc Esta condo is located a tiny distance from East Coast Park which can delight residents with amazing activities like cycling, rollerblading and picnic on the beach. Those who love nature can stroll through the nearby Telok Kurau Park, Bedok Town Park and Bedok Reservoir. The Kampung Ubi Community Club is not so far away from the condo and can be a great place for residents to spend their free time as they engage in a number of social activities. Parc Esta site (former Eunosville) was bought at $765 million. That plus the additional government charges of $194 millions works out to a breakeven price of $909 per square foot. According to analysts, the selling price for the condo will fall in between $1, 600 psf and $1, 700 psf. Industry sources say former Eunosville residents (who each pocketed between $2.25 million and $2.41 million from the collective sale) are invited to the launch, and that some may buy units at the new 99-year leasehold development. The process of securing a home loan in Singapore can sometimes be tiring and costly too. But if you have the right mortgage broker with you, finding reliable lenders and having your loan application approved quickly can be easy. 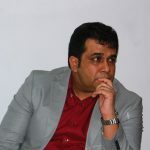 iCompareLoan mortgage broker is one of such brokers. With many years of combined industry experience, we can help you aim for the best lenders in town, compare home loan Singapore swiftly and choose a loan package that syncs with your home purchase needs. We’ll help you with everything right from mortgage repayment calculation all through to linking you directly with the lenders. And our services are all FREE of charge, which means more savings on top of convenience in acquiring a home loan.